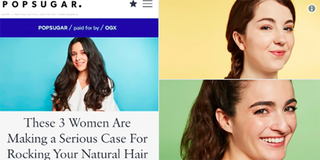 Women’s lifestyle brand PopSugar has some explaining to do after recently posting an article boasting about natural hair. People on social media quickly noticed the piece didn’t feature any women of color and had only white women discussing their “natural” tresses. Now, we all know the “natural hair” movement got its footing from women of color, particularly black women, so it’s kind of strange to see an article referencing natural hair but not one black or other woman of color. The article included staffers from PopSugar talking about their frizzy, thick and “textured” hair and how they love to rock it naturally. Sure, their hair may be free of perms or relaxers, but how many times have you ever heard a white woman refer to her hair as “natural”? Personally, I’ve only heard it once, and it was from a white woman with a head of thick curls who refused to relax her hair or straighten it, or use heating appliances on it. Sure, call your hair what you want to call it. But if PopSugar didn’t think they would be called out, I’m going to need them to have at least one woman of color on staff to be their woman-of-color whisperer.